Believe it or not, in a time not that long ago (although it may seem like a universe away), men used to be unconcerned with plucking their eyebrows, shaving off all their chest and leg hair, or getting a cucumber facial peel and “highlights.” Men used to be MANLY. They grew big, bushy moustaches and beards, refused to back down from any threat, and they were TOUGH! Hobby Crash (HC) clearly remembers those days. And their exciting new “Karateca” Geyperman figures instantly transport you back to those “manly” years; back to a time when martial arts masters Bruce Lee and Chuck Norris were battling to the death in the Roman Coliseum, or killing deadly cobras on a madman’s island near Hong Kong. Yes, they’ll take you back to the thrilling time of—the KUNG FU GRIP! 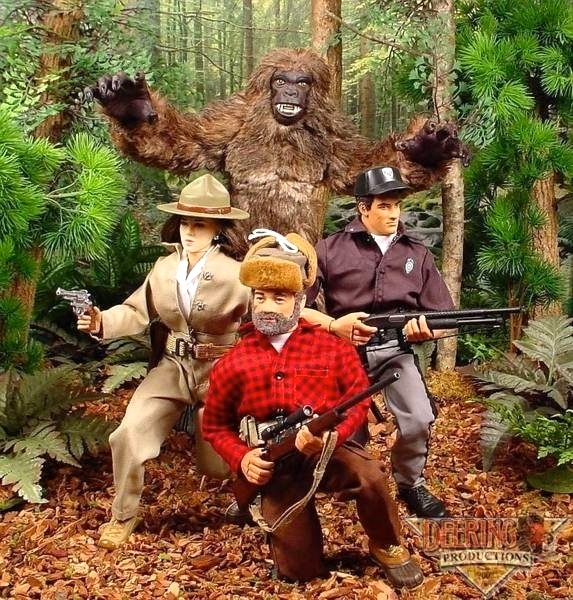 As always, our favorite Spanish toy company is using the ORIGINAL molds licensed to them by Hasbro back in the 1970s to create these ALL-NEW, outstanding, fuzzhead GIjOEs. 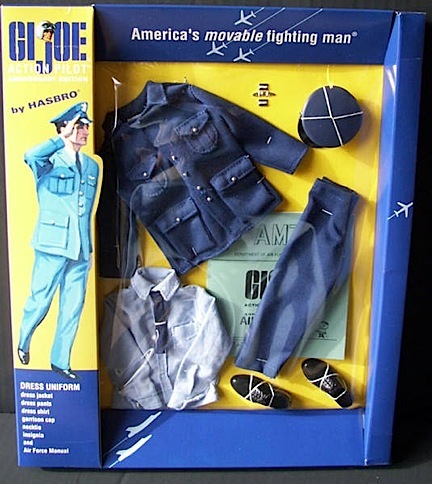 In addition, the figures are outfitted in ORIGINAL 1970s NOS (new old stock) clothing and outfitted with authentic 1970s accessories as well. Of course, as Hobby Crash’s amazing Geyperman line continues to expand, its stockpiles of original clothing and gear will inevitably shrink, and soon it will become difficult to keep separate what is NOS (new old stock) and what is not. But that really doesn’t matter, because the quality of EVERYTHING they’re putting out is top-notch—all the way down the line. This new “Karateca” figure is no exception. And though pricey ($79 plus s/h), it seems like a great value. When you consider all that you’ll receive; an all-new “vintage” Fuzzhead figure, its NOS outfit and accessories, plus paperwork and a brand-new 1970s-style box, the cost is very reasonable. 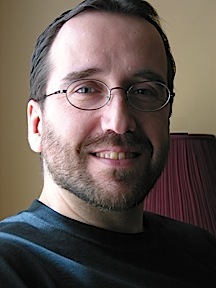 “Hi Mark, I’ve read your article about the Geyperman Karateca, thank you, it’s great! Only a commentary: The molds were not made by Hasbro but are from Geyper directly. Geyper made new molds from copies under the license agreement they had with Hasbro, but the tooling is not the same used for GIjOE. Most pieces are almost identical (to Hasbro) but some have minor differences, while others were exclusive from Geyper Industries. Customizer Wayne Faucher strikes again! Already widely renowned for his artistic achievements as an Inker for Marvel and DC Comics, Faucher’s fame as a creator of upper-echelon 1:6 scale custom action figures continues to grow as well (see our previous profile on Faucher HERE). Faucher’s latest creation is truly a one-of-a-kind. Based on an obscure 1970s comic book hero known only as, “Hunter,” it features a fully custom helmet, uniform and fighting staff. “He’s a character from those great Eerie Magazines back in the 1970s. I always thought Hunter’s combination of spacesuit and caveman fur made for a really interesting visual. Paul Neary was the original artist on the series, so he gets all the credit for that! This closeup of Faucher’s custom “Hunter” action figure reveals superb workmanship and details. Wayne topped off his “Hunter” figure with this cool-looking battle staff and a custom logo stand. Outstanding work, Wayne. Thanks for sharing “Hunter” with all the readers of The Joe Report! “To Open, Or Not to Open.” That is the Question All G.I. JOE Collectors Must Ask Themselves. 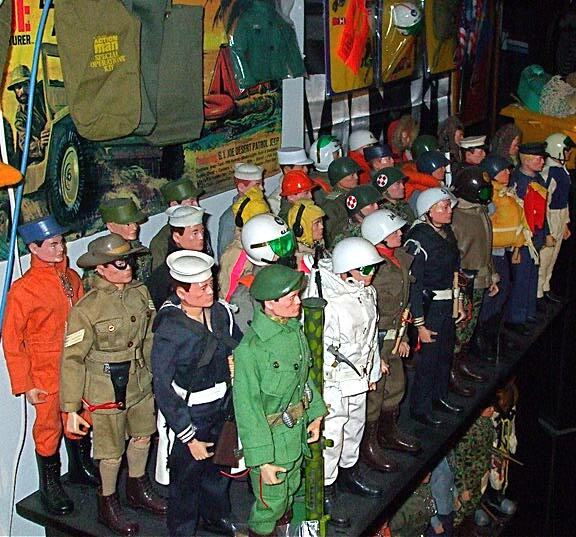 Sure, we’ve all seen collections of GIjOEs displayed proudly inside glass cabinets, professionally lit with track lights and arranged for maximum “WOW” effect. Thousands more are set-up in dioramas around the world, getting dusty or “weathered” with custom paint jobs. Even more are trampled, mutilated or even blown-up, all in the name of play and Joe FUN. Meet one such “MIB Master;” Johnnie Shedrick of Elyria, Ohio, has amassed an astounding, 500+ MIB GIjOE collection over the last decade and a half. He takes NOTHING out. He sets NOTHING up. Every Joe or vehicle is simply stacked and stored away. Only his family or visitors have ever seen his collection—until now. Starting today, Shedrick’s outstanding “time capsule” of a collection is available for viewing online over at the venerated, GIjOE Collections website. 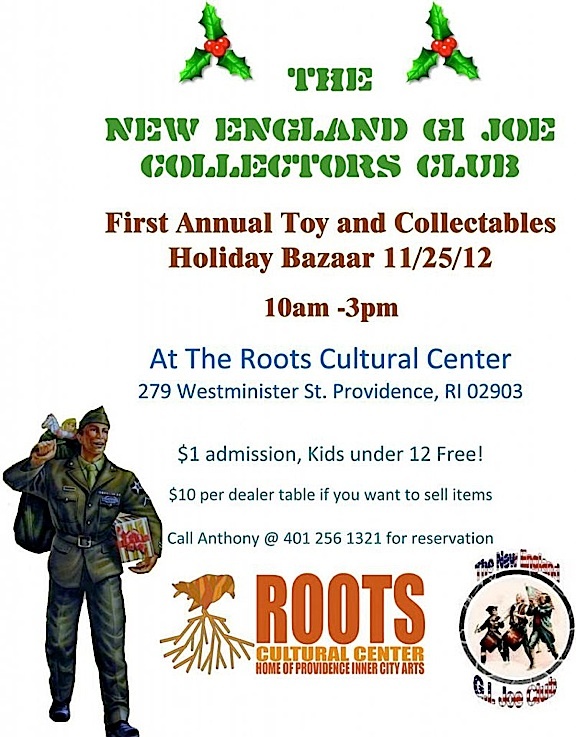 The impact of seeing so many unboxed, minty GIjOEs all in one place is absolutely riveting. Other fans may scoff or scream “FREE THE JOES!” But in the near future, Shedrick may become one of the leading experts on “the way it was” when Joes were NEW. To see what Johnnie’s been “hoarding” all these years, jump HERE NOW. As many fans will remember, Hagman had had a liver transplant and was struggling with throat cancer. Despite his ongoing health issues, he chose to continue working to the very end. 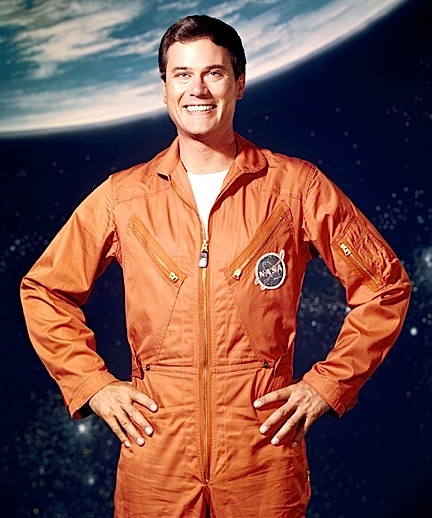 His two most notable roles were as beleaguered astronaut, Major Anthony Nelson on NBC’s I Dream of Jeannie, and later, as iconic, Texas oil man, J.R. Ewing on CBS’s Dallas. 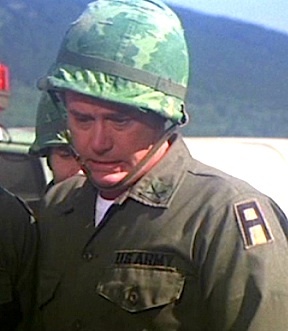 Hagman also had a small role in the 1976 film, “The Eagle Has Landed,” as U.S. Army Colonel Pitts. 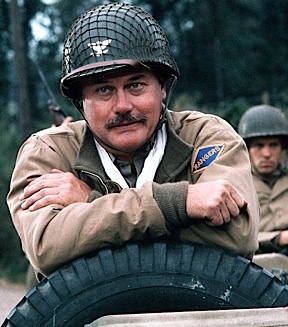 After thinking about it for a while, I remembered that Hagman had also portrayed military characters in film roles as well. The two that I recall the most are his quick, lusty, “About Face!” Army officer in 1978’s Superman, and as a “Colonel Pitts” in the 1976 film, The Eagle Has Landed. Both were minor parts to be sure, but there he was—each a definite Larry Hagman sighting. Woo Hoo! Sounds like a blast. Have a great time, guys. Please send us some photos afterwards! This week’s video is actually a series of short videos created by the U.S. Army. They’re like candy, each one leading almost irresistibly into the next. You’ll just want to just keep on going! 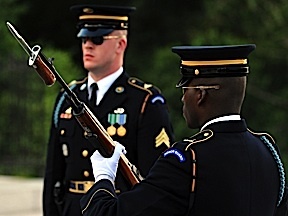 Soldiers of the 3rd Infantry Regiment are famous for a variety of reasons, but its most public duty involves providing 24/7, 365-day a year sentinels for the Tomb of the Unknown Soldier and acting as honor guards during veteran funeral services conducted at Arlington National Cemetery. 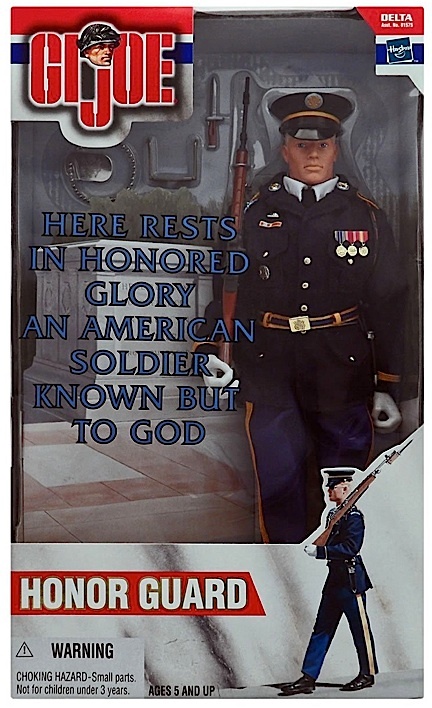 Of course, GIjOE and action figure fans fondly recall the superb Honor Guard figure released by Hasbro (see photo above) and the Elite Brigade version currently produced and offered exclusively by Cotswold Collectibles HERE. Both are superb figure sets, replete with detailed Army dress uniforms and the unique white-gloved hands. 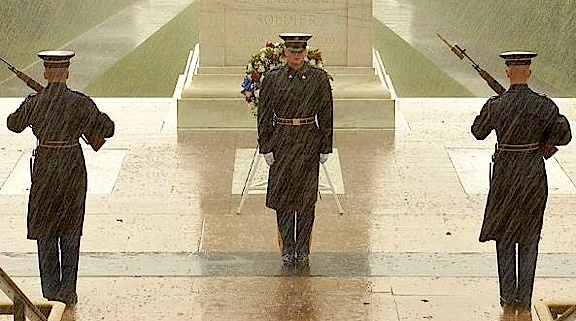 With Thanksgiving now behind us and Christmas just weeks ahead, we hope you’ll take a moment to stop, reflect and give thanks to all those who do so much for our country, our servicemen and women, their families, and especially the members of the Army’s 3rd Infantry Regiment “Old Guards.” Not even Hurricane Sandy could make them abandon their post! The new, limited-edition “Foreign Air Adventurer” currently for sale on the Transformers Club online webstore. 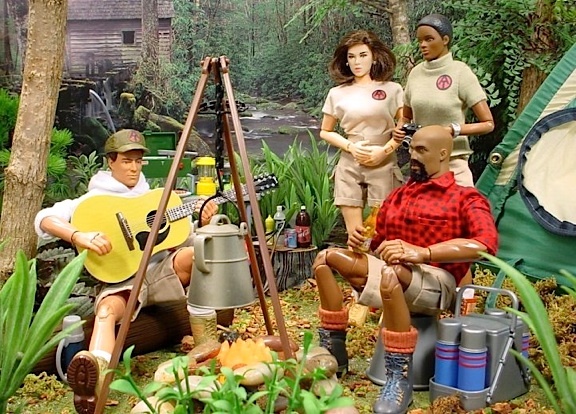 Call it the Spirit of the Holidays, or just spreading Joe Karma; whatever the reason, Tom Calhoun of Adventure Gear (AG), a longtime creator of 1:6 scale clothing for Adventure Team fans, has begun an exciting “Let’s Give Stuff Away” event over on Facebook. Another exciting diorama shot by the uber-talented, Dan Dibiase. HA. Okay, there you have it. If you’d like to see who wins Tom’s exciting “Let’s Give Stuff Away” events, we suggest you “LIKE” Adventure Gear over on Facebook today by visiting them HERE. Best of luck to all who enter! When Scaletta sent us photos of his collection recently, you could hear a pin drop while the staff here at The Joe Report gathered around our main viewing screen, staring in awe at the majesty of it all. Finally, a low, slow whistle was heard, followed by one staffer’s apropos comment, “Man, oh man, oh MAN. This guy’s got it all!” Well, not everything. Not quite. Not YET anyway. It’s easy to see why “Dapper Dan” received his well-deserved sobriquet (nickname). 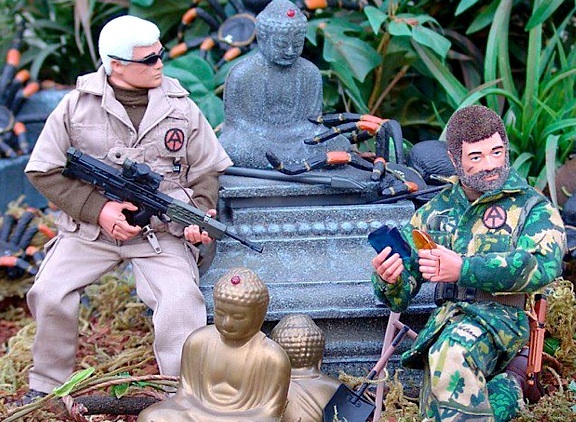 His self-deprecating attitude and generous demeanor have made him one of Canada’s most famous GIjOE collectors. If you have a few moments, we recommend you pay Dan a visit by jumping directly to his new featured page HERE. Aurora gives her new best friend “Bowzer” a big hug and makes sure that his scarf is all snugged up for their “walkies” around the neighborhood. Yesterday, at our local Meijer store, I came across a new endcap display of Christmas ornaments based on a variety of Sandicast’s famous sculpted dogs. There were about a dozen different breeds being offered, all in different poses (standing, sitting, playing) and priced at $14.99 each. 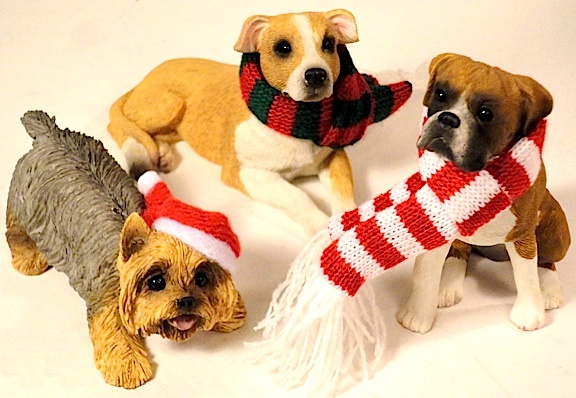 These are EXCELLENT representations of dogs at 1:6 scale. The sculpts are highly accurate. The paint jobs are superb. 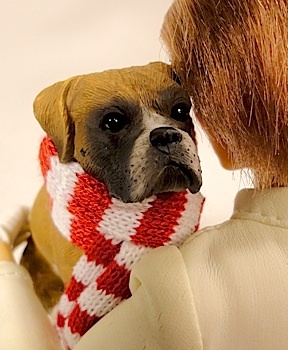 And the attached (real cloth) scarves and Santa hats add an extra level of tactile reality and “cuteness” that make them practically irresistible. 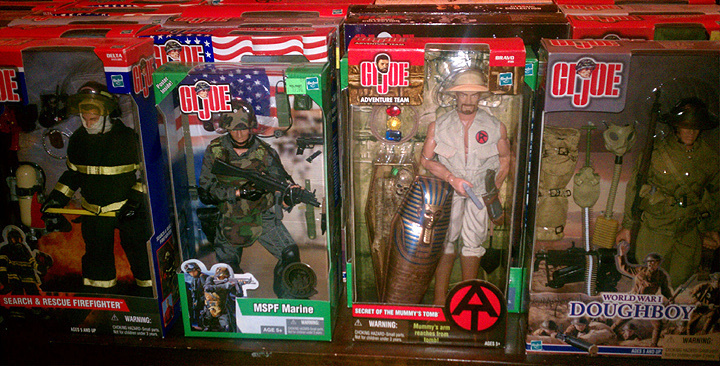 Your Joes will LOVE ’em! “Internationally renowned San Diego artist Sandra Brue has been bringing sculptures to life for over 25 years. She founded Sandicast in 1981 and it was a success right from the start. The only problematic dog was with the Chihuahua. He was definitely too big for use with GIjOE. At one-sixth scale, a Chihuahua should’ve been much smaller, but then it probably would’ve been too small to sell as an ornament. All the other dogs seemed pretty correct (to me), and so I ended up picking up the three versions shown in the photos. Bottom Line: These are some of the best dogs you’ll ever find at 1:6 scale and make wonderful additions to any diorama. But there are some caveats… 1) They’re not poseable. 2) Since there are variations in size (like that too-large Chihuahua), it’s better to see them in person in the store before you buy. And 3) They’re kind of pricey. But you do get what you pay for (top quality). My recommendation is that if you can wait, rush through Meijer AFTER Christmas. They should be blowing them out on clearance for a lot less by that time. If you can’t find a Meijer store near you, you can always purchase them directly from the Sandicast website (but at full price + shipping). The site’s ornament pages start HERE. Happy Hunting! WOOF!